Do you want to enjoy a Hollywood smile? Thanks to cosmetic dentistry, it is now possible. Say hello to Porcelain Veneers! Not only are veneers used to hide cosmetic defects, but they are used for correction of the shape and alignment of the teeth. Veneers are very thin shells of porcelain which are attached to the front surface of teeth to restore their esthetics, function, and structure. 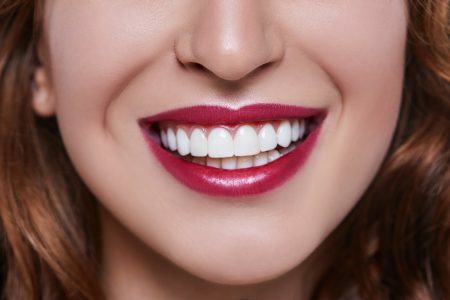 Porcelain veneers match the color and shade of your natural teeth and once they are placed, they blend-in with the surrounding teeth, thereby giving you a naturally beautiful and attractive smile. Who can benefit from Porcelain Veneers? To Hide Permanent Teeth Stains – some developmental teeth stains are permanent, and they cannot be removed even through professional teeth whitening procedures. To restore smile and facial esthetics in these cases, veneers can be bonded to teeth to mask the stains and give you a beautiful smile. Excessive Teeth Gaps – Spacing between teeth can be a concern for people. For patients who are not willing to undergo orthodontic treatment for the correction of these gaps, we offer porcelain veneers which are designed in such a way that they will cosmetically fill the gap and restore the esthetics and function of the affected teeth. Crooked or Chipped Teeth – Veneers are also useful in the cosmetic restoration of crooked or irregularly shaped. Another use of porcelain veneers in cosmetic dentistry is the correction of misaligned teeth, in cases where patients do not wish to undergo orthodontic treatment for tooth realignment. Hollywood Smile – a Hollywood smile is not just for the celebrities! If you are not satisfied with your smile or the shape of your teeth, we can give you the smile of your dreams with porcelain veneers. Clinical Evaluation – first, our Dr. Dhaliwal will perform a detailed examination of your oral cavity to make sure veneers are the most appropriate option for restoring your smile. Tooth Preparation – next, Dr. Dhaliwal will prepare the teeth for attachment of veneers by removing a thin layer of the natural tooth structure. Tooth preparation is done to create room for the porcelain layer that will be bonded to the tooth surface. Impression – afterward, an impression of your teeth will be taken which will be sent to the laboratory for preparing your veneers. At this stage, information regarding the shape, size, and color of your natural teeth is also sent to the laboratory, so that matching veneers can be prepared. Bonding of Veneers – during your next appointment, we will try the veneers on the prepared teeth without bonding them. Any minor adjustments, if required, are performed at the chairside. Once you and Dr. Dhaliwal are happy with the esthetics and fit of your veneers, they will be permanently bonded to the prepared teeth. Taking care of Oral Hygiene – optimal oral hygiene is not only necessary to prolong the life of your veneers. Make sure that you brush and floss regularly. Regular Dental Visits – regular dental check up visits will not only ensure that in addition to making sure that you have healthy, but we will also evaluate your veneers and other prostheses. In this way, your veneers will serve for a longer time. A beautiful smile awaits you at Aberdeen Dental. Visit us today and call (250) 545 3319 for a consultation with Dr. Dhaliwal to get a beautiful and charming smile with porcelain veneers. So hurry up and book an appointment today!